This device was a life-saver. I eventually bought two. Sleep has never come easily for Ryan. To be more precise, staying asleep has never come easily. Over the years, we have figured out a routine — melatonin, bedtime reading, white noise, soothing music, weighted blanket — that usually gets Ryan to sleep rather quickly. But he wakes easily, and frequently (although much less often since he began using the weighted blanket), and is up for good very early. Early morning wake-ups have just become part of our family life. I like to say that I haven’t set an alarm since Ryan was born, and other than days when I need to get up at some insane hour to catch a flight, that is pretty much true. He has been consistently early to bed, early to rise, and restless in-between. His sleep schedule is like a delicate flower that must be protected at all costs. Anything that interferes with the routine can throw him off, and when he doesn’t get enough sleep, his all our behavior suffers. As he has gotten older, he has become a little more flexible, able to tolerate, for example, going to a night-time Devils game without turning the following day into a disaster. But it’s the days when he can’t get to sleep that really throw all of us for a loop. So I knew we were in for a long night last night when I got home from playing hockey at 10:30 to find Veronica curled up on the corner of Ryan’s twin bed, trying to coax him to sleep. She had already been at it for a couple of hours and was beyond exhausted and frustrated. These nights strike unpredictably, often without reason. But last night, the cause was more evident. One of Ryan’s tics, in which he pops his eardrums by holding his nose and exhaling, was the culprit. This is a habit Ryan developed over the last year and which caused many miserable nights this summer as he popped his eardrums to the point of pain. It faded seemingly on its own, and we thought perhaps it was in the past. As I came into Ryan’s room, Veronica said “your turn,” and shuffled off to bed, just as I would have done. I took off my shoes and took her place, folding myself into the smallest shape possible around his body on the small bed. Ryan didn’t say much, other than to tell me he was trying to stop popping his ears and express anger over not being able to fall asleep. Mostly, I just listened to his breathing. I found myself counting the seconds between his movements — a trick I used when he was an infant — as a way of judging when he was asleep. After about five minutes, the record was still seven seconds, so I gave up. Ryan sat up and told me, “I wish I had the whole bed,” so I grabbed his quilt, the one with the 30 NHL team logos, and his San Jose Sharks pillow pet, and did my best to get comfortable on the floor next to him. I resumed my vigil of listening to him breathe. I was transported back to his infant and toddler years. How many nights had one of us spent in his room in some similar position? For his first year, I don’t think he ever went more than three hours without waking up. We tried everything. Earlier bed times. Later bed times. Altered nap schedules. Various soothing sounds. We finally hit on one device that he seemed to love. 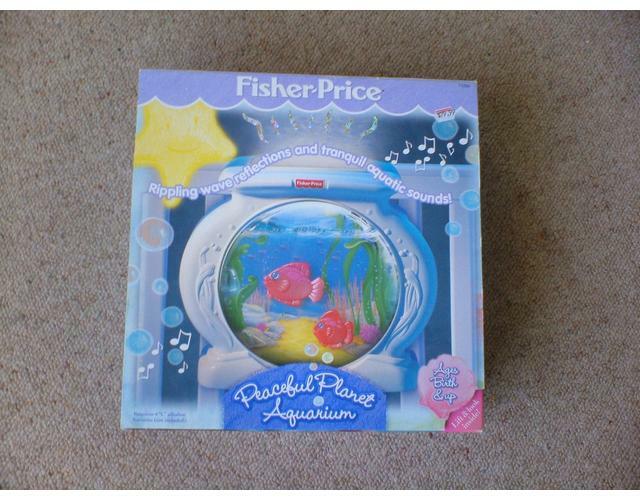 It was called the Fisher Price Peaceful Planet Aquarium. It was a mechanical fish tank, and when turned on, the little plastic goldfish rotated around the bowl as dim lights projected on the ceiling amid the sound of crashing waves. It played for seven minutes every time you turned it on. Ryan very quickly figured out how to turn it on himself, and he got to the point that any time we heard him stir on the baby monitor, the next thing we heard was those crashing waves. Sometimes he fell back asleep during the first seven-minute cycle. Other times it took two or three, but it prevented him from crying out for us every time. I think it cost $30. I would have gladly paid $3,000. There was just one problem with the aquarium. It ate batteries — four C-cells at a time. I bought rechargeable batteries and made sure I always had a fresh set ready to go. But like all kids toys, the battery cover required a screwdriver to open. One night, Ryan turned it on to soothe himself, but it died right away and he lost his mind. I bolted out of bed and set about trying to get the cover open to swap the batteries while he screamed at the top of his lungs and Veronica yelled at me to work faster. After that, I decided to buy a second unit, only it had been discontinued. I found one on eBay. That way we had one with charged batteries ready at all times and I could hot-swap them in a few seconds. He eventually outgrew the aquarium when he moved to a toddler bed. I think I sold them on eBay. These days he has an iPod in a speaker dock which plays the same lullaby CD we bought when he was born. He sometimes turns it on himself if he is having trouble falling asleep. As I lay on his floor listening to him breathe last night, I silently cursed whatever it is that prevents him from finding peaceful rest, knowing what it would do to him, and all of us, today. We both eventually fell asleep, and he managed not to wake up until well past his usual time. Of course, that only made him angry at the loss of morning free time. He will find a way to navigate this day, as will we, but it doesn’t make it easy — or fair. Veronica has already reached out to the behavioral therapist to address the ear popping. We will get this figured out, just as we have so many other obstacles. My beautiful boy works too hard to navigate each day. He must have his rest. What are your sleep strategies? Feel free to share in the comments. We’ve never had any sleep issues and for that I am eternally grateful. I hope you all get some peaceful nights soon. Does he drink anything warm/hot before he goes to sleep? My kids both ask for warm (strawberry) milk or sometimes a non-caffeinated tea before they can relax in bed to sleep. That’s an interesting idea. Ryan has never had anything warm to drink — ever. He is so picky about food/drink … about all he will drink is V8 Fusion (sometimes mixed with milk — it’s not as gross as it sounds… ok it sorta kinda is but he likes it) and water. He has never had a plain glass of milk. He refuses. The thing is, going to sleep is not usually a problem, and when it is it is difficult to pinpoint the reason. My favorite line: “I would have gladly paid $3,000.” – oh, how I have been there! When restless nights started to keep my younger child awake as well, I would have paid more! Hmm. It was close to a full moon (I know since Ryan has been keeping a moon log for science homework). Maybe that had something to do with it. And you’re right. In those moments when we were literally asleep standing up leaving over Ryan’s crib trying to get him to go to sleep, I would have paid more than $3,000 for anything that would help. A LOT MORE. Oh, how I feel your pain. Ryan’s early sleep experiences rival Tate’s. They were so similar. In fact, we had the “newer” versions of that aquarium for Tate. When he burned out the motor in the one we had from Jake, we bought him a new one. It helped tremendously. Those aquariums are worth 10x’s their weight in gold! Hope his restlessness is short-lived and that he goes back to falling asleep easily. I know how brutal it is to fight that fickle beast! I always thought I could make some money writing a “guide to baby gear that really matters” … maybe I’ll turn it into a blog post. 90% of the baby crap you’re convinced you “need” turns out to be useless. But those 10% of useful items — they are indispensable, irreplaceable and invaluable. Yeah … Nobody really NEEDS a diaper genie. For us the absolute BEST thing we had was an electric rocker. haha @the jay train…I was so excited to get the diaper genie. i was sorely disappointed. I remember the point when I realized that the diaper genie smelled worse than the diapers. And that thing was a self-contained environmental catastrophe. Hey let’s take one environmental nightmare — disposable diapers — and wrap it in tons of non-biodegradable plastic! I am embarrassed we ever owned one. I’m pretty sure it was long since disposed of by the second kid. That is a great idea for a post Neil! For the first year of my son’s life, I slept more on the floor by his crib or in the glider rocker than in my own bed (and that’s when I held a 40+ hour a week job). At 10, he’s grown used to the routine of 8:30 being bedtime, even if he’s not at all sleepy or very sleepy and not able to. He stims or disappears into his own mind. He wanders out of his room almost nightly, however. A glass of water or the bathroom or a bug or a needed stim tool or a blanket issue…it’s always something. This makes adult-only time hard to come by. I’ve grown used to the lack of sleep, plus I can nap with the toddler during the day. The real burden is not being able to relax and be alone with the husband. Also, regarding his popping of the ears…my son’s intermittent issue is scratching. One mosquito bite starts the process. He’ll scratch himself until it’s a bloody, disgusting mess. Today, he has over 75 scratches. I know because I count them. Open wounds cover his arms and legs. People in public places try not to be rude, but I’m sure their concern is that he may have measles or pox or some other contagious virus. Nope. He just has an obsessive need to scratch his skin off. Good luck with your son. I hope the behavioral therapist manages to help him. Thanks for posting this. None of the local soccer moms/dads can relate at all to these things. Ugh BUGS. This is a recent phobia, and it seems to be getting worse. He’ll run screaming from his room “THERE’S AN ANIMAL IN MY ROOM.” That animal? It’s a gnat. Plus he scratches his mosquito bites too. Just last week I carefully cleaned and bandaged a half-dozen or so just on one leg. What a waste. The band-aid were all pulled off within 10 minutes. Sigh. My psychologist sister has told me that kids with Aspergers and HFA tend to have more sleep issues. *shrug* Doesn’t help the fact that I have not slept since 2006. Also, what is with the bug thing?! My son is absolutely repulsed by them..and yet, intrigued. He seeks them out and then absolutely freaks when he’s near one. This is one perseveration that I cannot wait for him to leave behind. mine pulled his off at first too. it’s been years of fighting this issue. we live in southern louisiana, mosquito central, so this problem pops up regularly. he eventually got better about leaving the band-aids on, but he still sneaks one off when he thinks we won’t notice. Are there any really good books that would help the family/friends learn ways to help the families. I want to be there for my nephew and the family. I try to help even if it is just listening, going with the ebb and flow when together, donating or educating others (expecially when they are stupid with words, etc..). But there has to be something more! For one thing I would like to know if there is a simple book or educational flyer that I could hand over to people. “Knowledge is Power!” And being able to just hand something over to them is so much nicer than what I really want to do and say. it depends on what it is that you want to convey. there are business cards with quotes or a polite way of saying, ‘stop staring please’. however, i don’t know your nephew and his family, and some people get offended when others speak on their behave. others welcome it. my advice would be to take what you just posted here and send it to your nephew. what is helpful to one family may not be helpful to another. 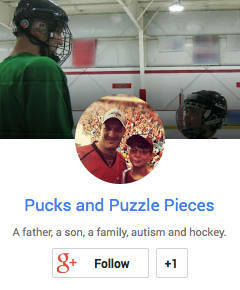 Her nephew’s family knows – and deeply appreciates – her efforts to understand Ryan. Yes, she’s our Aunt Mary. And her nephew appreciates the efforts she makes to engage him in his interests every time he visits.